﻿ Magazine content за Май 2011 г.
E.P. Makarovskaya The main thing about any profession is to love what you do. What is your attitude towards appeal that is being introduced in general courts? To what extent will it improve the judicial process and protect civil rights? What difficulties can you already now see in enforcement of this law? The article considers theoretical aspects of the mediation procedure in connection with passing of the Federal Law on mediation and making relevant amendments to the arbitration proceedings. A brief comparative analysis of the mediation procedure and of a traditional amicable agreement and the author's evaluation of legal consequences and differences between the named procedures of settlement of disputes are suggested. The article is devoted to questions of judicial regulation of the institute of professional representation by the example of the Arbitration Procedure Code of the Russian Federation and the Sport Justice Code of Brazil. 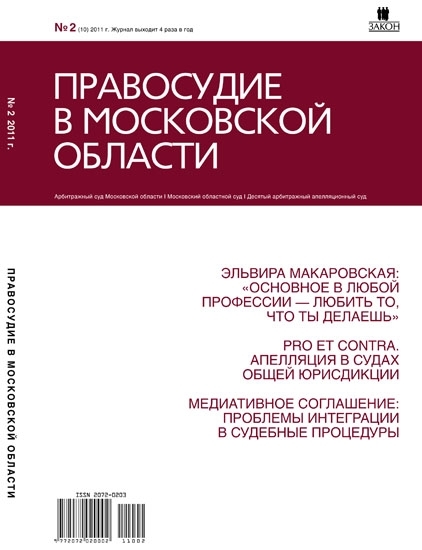 The author analyses legal views of the Constitutional Court of the Russian Federation, summarizes viewpoints of the administration of the Supreme Commercial Court of the Russian Federation and representatives of the local legal community on the topics under consideration and refers to the foreign experience. Amendments introduced to the Arbitration Procedure Code of the Russian Federation by the Federal Law dated July 27, 2010, No.228-FZ have cardinally changed many of the arbitration proceeding institutes. The norms of the Arbitration Procedure Code of the Russian Federation regulating the procedure of judicial summons of persons participating in the case were subject ot considerable changes. This article =ouches upon several urgent questions concerning changing of order of judicial summons of participants of the arbitration proceedings. The institute of provisional measures aimed at protection of rights of participants of the civil turnover is not new for the Russian arbitration proceedings. However questions of application of provisional measures when settling of disputes on protection of exclusive trademark rights by commercial courts keep on staying up-to-date. Most of the problems arise in connection with taking by commercial courts of provisional measures in cases of submission of counter injunction. This article considers legal aspects of development of the institute of intermediate court procedure, of enforcement of judgments made by intermediate courts and analyses legislation regulating this type of activity. This article considers court practice at the level of federal commercial courts of circuits with participation of the Agency of Deposit Insurance in the year 2010 connected with the Agency's performing functions of a bankruptcy manager (liquidator) of credit organizations, with exercise of powers of temporary administration on managing a credit organization as well as other powers of the Agency as a credit organizations turnover company. The article is devoted to questions arising as a result of the citizenry's protection of their rights in the interstate agencies, the opportunity of appealing to which is provided for in the Constitution of the Russian Federation. On the basis of the activity analysis of the stated agencies the importance of the European Court of Human Rights and its role in restoration of the applicants' rights are considered. The article considers most ugrent questions of marital property relations, taking place both in theory and practice. The author touches upon the correlation of notions "property of spouses" and "ownership of spouses", investigates problems of the matrimonial property regime, separation of matrimonial property and of responsibilities of spouses by commitments. The right of property to a newly developed item of immovable property is subject to state registration. In this connection it seems necessary to work out order of putting special marks into the Uniform State Register of Immovable Property Rights and Transactions indicating death of the rightholder, and to compel the notarial agencies to issue certificate of inheritance right to the successors who inherited immovable property from the ancestor who in due time also inherited this property but didn't register the right of property for it in accordance with the procedure established by law. Passing of the Federal Law "On customs regulation in the Russian Federation" has completed the process of forming of laws on customs affairs. What are the main purposes of the national customs regulation? How efficient is the mechanism of their enforcement under the conditions of forming of common customs space? What provisions of the Federal Law assist in protecting the domestic market and ensuring national safety? In actual practice questions arise concerning interpretation and application of the Law provisions, interaction of customs authority and business, protection of rights and interests of participants of foreign economic activities and persons belonging to the infrastructure related to that of the customs, performance of customs agencies law enforcement activities. Development of criteria of customs authority performance evaluation, unified interpretation of customs legislation provisions, creation of safeguards system and system of liability of authorities before business will allow to complete global tasks of customs regulation. The author of this article considers such a burning problem as creation of e-government in Russia and influence of this process on the Federal Bailiff Service. The article is devoted to certain problems of aggravations of compulsion to settlement of a transaction or to its termination. The author evaluates the notion "violence" being the question of clause "b" Part 2 Article 179 of the Criminal Code of the Russian Federation and gives a rather-legal analysis of this term with other articles of the Criminal Code of the Russian Federation, he also considers the question of classification of crimes commited by office-holders. The article formulates a thesis according to which in the modern context the charter capital has lost its function of being a guarantee of creditors' interests and it is impossible to establish control over the current asset liquidity through control over modes of payment of floated stocks. Inefficiency of dynamics control of net assets cost by means of their juxtaposition to charter capital nominal value is shown. Revision of a formal stock essential - its nominal value - is absolutely contentless in the economic aspect and in no case influences the degree of securing obligations of an economic society to its creditors.